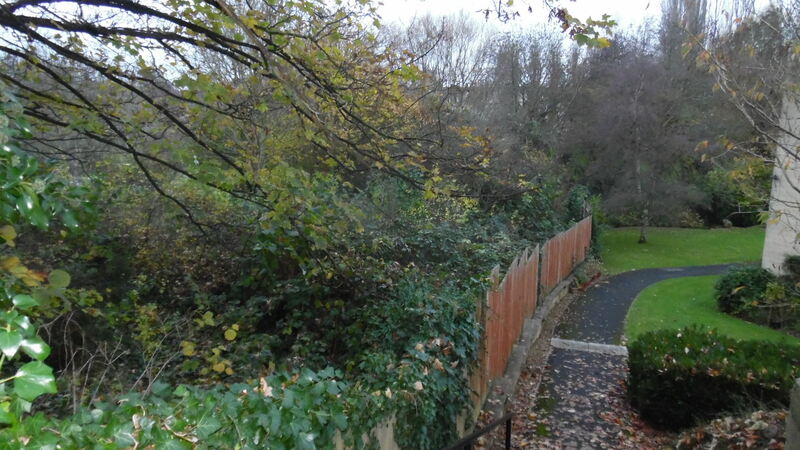 For many years there has been a desire by locals in and around Larkhall & BANES Council for the construction of a shared path & bridge across the Lam Brook to allow direct access between the Square & Alice Park. Plans have been submitted to develop the Harvester site into retirement apartments. An access path to these homes will also provide a very easy, level,& safe walk into the square for those residents. 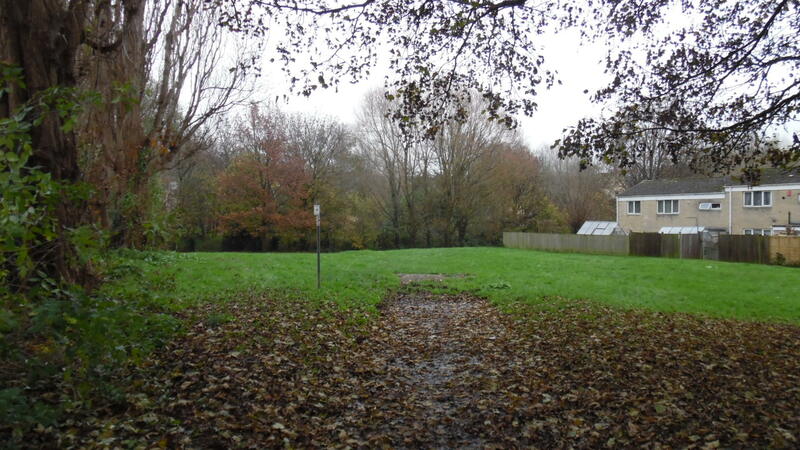 …and leads to the open space grass near Lambridge St. A new path will lead down to the bridge across the brook. 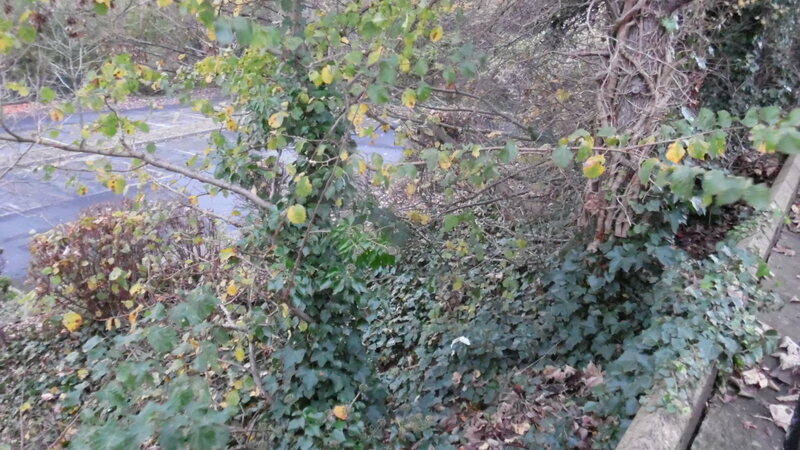 These next photos are a bit unclear due to the undergrowth. A few trees will need to be removed/replanted and the exact path location would be determined by the architect & engineers. Looking across the brook to Pitman Court. 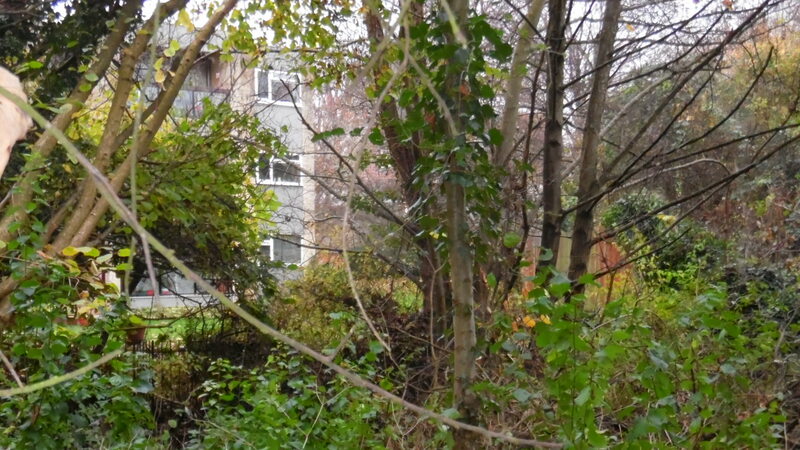 A bridge & new path will be constructed between the existing flats & new Apartments. 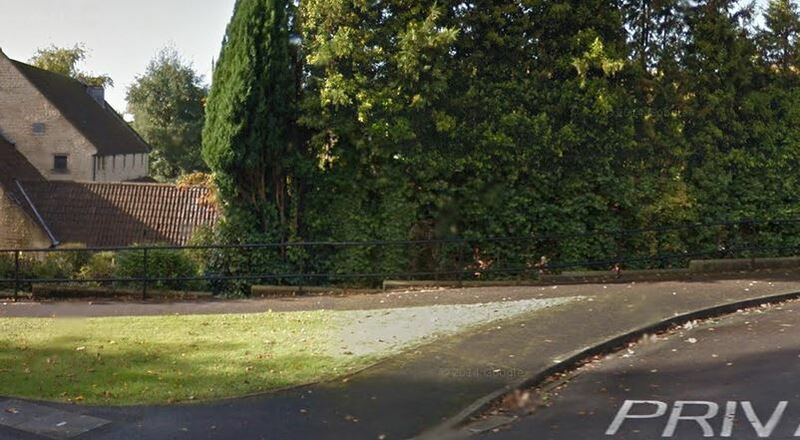 …to join into Pitman Court Road approximately here. 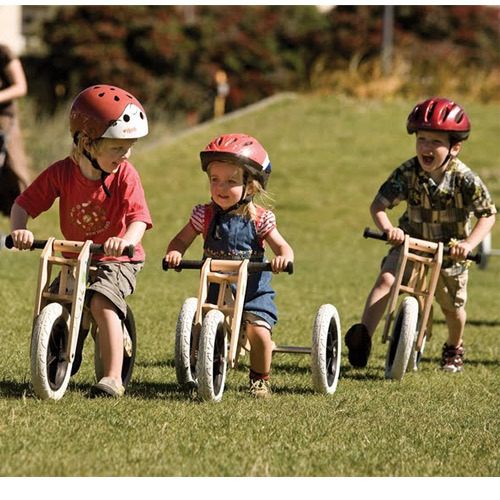 Previous PostConservative Party response to Cycle Bath analysis of their Transport ManifestoNext PostCycle Racks On The Front Of Buses PROGRESS! The Harvester site re-development perhaps provides the opportunity, but my guess is that isn’t only for a cycle path. 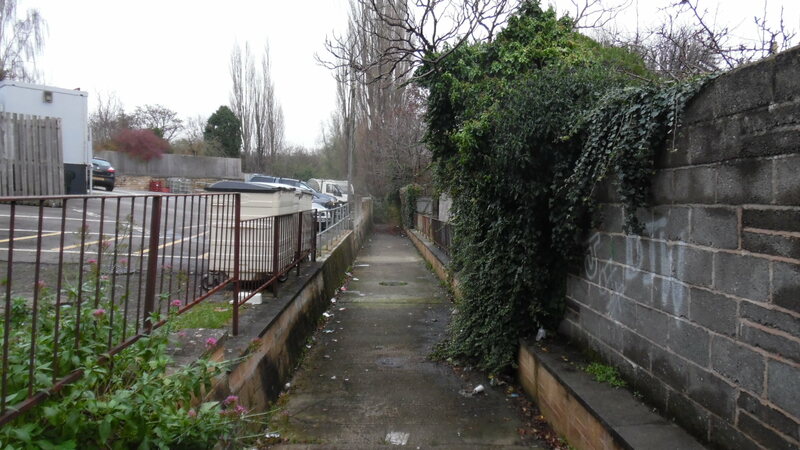 The path has to join Pitman Court Road by crossing either Pitman Court land or the Harvester re-development. The new proposal for the Harvester site is for assisted living accommodation with 50 units and a mobility scooter store. 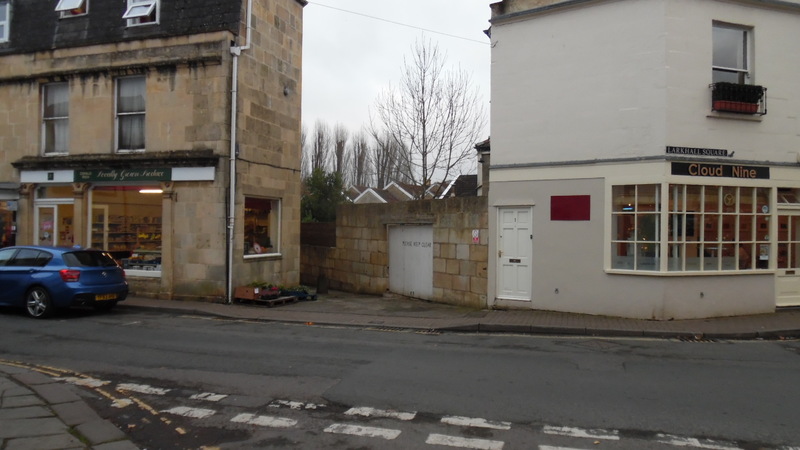 I think it is an even more ideal route for mobility scooters – allowing residents easy access to Larkhall shops – as it is for cyclists, pedestrians, buggy pushers etc. And skaters, assuming the skate park goes ahead. Although I’ve hosted this article on a cycling website & it would be a shared path, I think it needs emphasising that it would not be a route for speeding middle age men in Lycra. The latest photo I’ve just added indicates a group of the primary users. Not only could this path bring great benefit to the retirement apartments, but also Pitman Court residents if a link path was constructed into their estate. Has any discussion taken place with the Pitman Court owners about accessing their private land and road? Hi Val. Not yet, it’s still a bit fluid, Depending on the layout it may not encroach their land. I’ve been wondering how much of the bell mouth & patch of grass at the Gloucester Rd they own. Do you have any ideas or suggestions? Hi. We’re fully in favour of this proposal but are wondering whether there has there been any development of it? According to the council it’s not part of the planning application for the redevelopment of the Harvester site so is it CycleBath proposing it? And, if so, how to you envision the process for it being built? Thanks. I think David just thought through what would be needed and put the proposal together. This is very much down to the developers of the site working with the community to drive this. I would strongly suggest getting your local councillors on the case. They are in the position to drive this idea forward. CycleBath can only suggest these things. It’s councillors working with council officers that can deliver on these suggestions. I really hope it comes off as it would be a really good family route to Alice Park. London Road is horrendous to have your kids walk along it to the park.